Bright, fresh and wonderfully flavored, this quick and easy tomato salad recipe is always a hit. 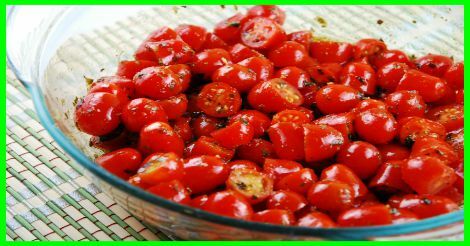 The tomatoes take on a delicious transformation after soaking in the marinade, and the low Points + makes it an ideal Weight Watchers side dish recipe for just about any meal. Place halved tomatoes in a medium sized bowl. In a small bowl, whisk together the remaining ingredients. Pour over tomatoes and toss to coat. Season with additional salt and pepper as needed. TIP: The simplest way to slice a bunch of cherry tomatoes is to sandwich them between two plastic lids and run a long knife through all of them at once!